Based on her work with Superstorm Research Lab, SRL member Max Liboiron has published a chapter on "Disaster Data, Data Activism: Grassroots Responses to Representations of Superstorm Sandy" in an edited volume on Extreme Weather and Global Media. This special issue of Resilience: Policies, Practices and Discourses will explore the indeterminate political ecologies opened by the Anthropocene and resilience. Taking a historic perspective focusing on the 19th and 20th centuries, the conference will explore the interactions between property systems, resources and environments, and the particular class of socio-ecological processes that is disasters. The conference will be held on 2-3 December 2015. Deadline for submission is 15 May 2015. SRL members Daniel Aldana Cohen & Max Liboiron have published a summary and update of The Tale of Two Sandys in the latest edition of Metropoltics in time for the three year anniversary of Sandy's landfall in the region. We summarize the two Sandy framework, and then move on to describe the second Sandy based on recent research by community- and advocacy-based organizations. This issue of FMR, to be published in May 2015, aims to discuss the linkages between climate change, disasters and displacement, the impact of both internal and cross-border displacement, measures to prevent or reduce the likelihood of displacement, and approaches to ensure the protection of those who are displaced (or who are unable to move). Workshop: Can Laws Make Communities Safer from Disasters? You will get a chance to participate in a South Asian legal experts forum to bring about innovative changes required in "Environmental and International Humanitarian Law concerning rescue, relief, rehabilitation and compensation for losses incurred during disasters". Ashley Dawson, a prof at CUNY and a friend of Superstorm Research Lab, has helped organize "World of Matter," an exhibit and conference mixing art and academe at the CUNY Graduate Center. Come on Tuesday, September 9th for the reception and book launch, and Wednesday for the conference. Sandy Storyline is an award winning participatory documentary that collects and shares stories about the impact of Hurricane Sandy. We are seeking a research volunteer or intern to help us research press, reports, data and other information as part of the ongoing post-Sandy recovery. Responding to demand from state, local and tribal leaders who are working to increase the safety and security of their communities, the nearly $1 billion competition will invite communities that have experienced natural disasters to compete for funds to help them rebuild and increase their resilience to future disasters. This NSF funded Enabling Program is an education and training effort aimed at developing junior faculty to become active scholars in both their individual disciplines and in the broader hazards and disasters research community. We are researching how people's affiliations with OWS, Occupy Sandy, and other CBOs and activist groups change over time. The project is meant to show that a metric of success for social movements is how people continue to work in activist/community settings, even after the "end" of public protest. We are looking for people affiliated with Occupy Sandy or OWS to fill out a short, 10 minute survey. We consider the politics of remembering, commemorating, and supporting long-term recovery in relation to a range of compound catastrophes that have deep colonial roots. Given that Bhopal, Rwanda, and the Tsunami have all generated significant media interest alongside diverse forms of creative response (from art to social activism), this conference will explore how these and other postcolonial disasters have been defined and represented following the initial event. It will examine the particular challenges posed by different forms of disaster (industrial, environmental, social), and connect these with aid and reconstruction work across multiple sectors. New report on the roles of activists and community-based organizations after disasters. The North Star Fund has released, "From the Edge of Disaster: How Activists and Insiders Can Use the Lessons of Hurricane Sandy to Make the City Safer," a research and recommendation report drawing on 30 interviews with community-based organizations (CBOs) and participation in dozens of meetings and conferences across the city over the past two years. The Third International Conference on Urban Disaster Reduction (3ICUDR) will be held September 28–October 1, 2014 in Boulder, Colorado. Join SRL members Daniel Aldana Cohen and Liz Koslov for Misdirection on the Hudson: Wall Street, Climate Change, and the Transformation of Staten Island. Our walk begins at the charging bull, where we dissect the little-known ways Wall Street contributes to the climate change behind Sandy's destructive force. Then, on the Staten Island Ferry, we describe Sandy's aftermath for Staten Island residents, and how complex financial instruments—insurance schemes, mortgages, loans—have prolonged the storm's disastrous wake and kept homeowners from rebuilding. Off the ferry, during a quick stroll on the St George Waterfront, we explore what is being built with Wall Street's backing: a designer outlet mall, the hemisphere's largest ferris wheel, a luxury hotel—and a sustainability museum. SRL member Liz Koslov has published an article on “Fighting for Retreat after Sandy: The Ocean Breeze Buyout Tent on Staten Island” in Metropolitics. Ocean Breeze residents are part of a movement for post-Sandy home buyouts that extends across Staten Island’s East and South Shores. These residents want to do a “managed retreat” from the coast, so that their destroyed neighborhoods can be returned to wetlands that would protect nearby areas from future storms. 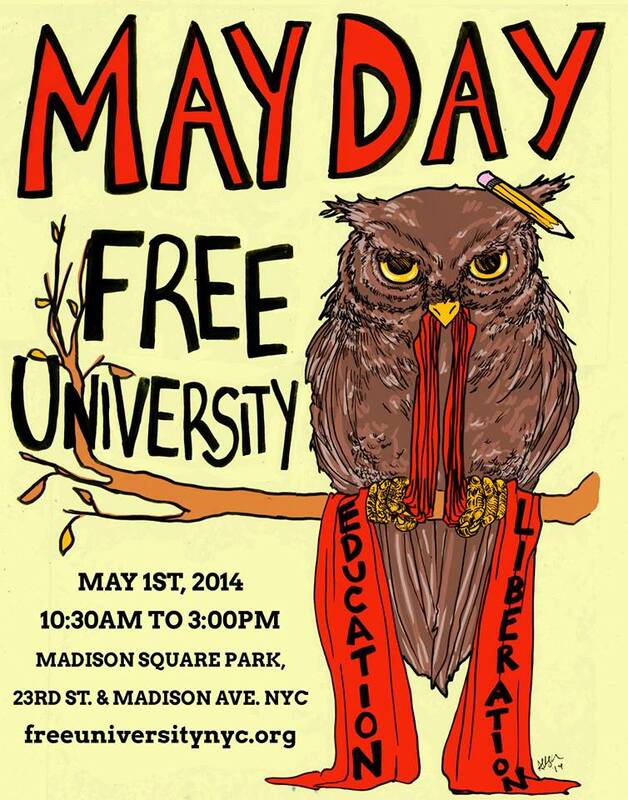 As part of Free University, SRL member Max Liboiron will be facilitating a workshop on Mutual Aid Research Models and Methods on Thursday, May 1 at 11AM in Madison Square Park. Mutual aid is characterized by solidarity (fellowship arising from common responsibilities and interests) and reciprocity (mutual, though not necessarily symmetrical, exchange). A mutual aid model does not only seek to “do no harm,” it also strives to reciprocate, to respond, and to cooperate. It takes the processes and practices of research, not only its results, as a place to do meaningful normative & activist work. We will discuss some existing models and resources for transforming research ethics, methodologies, and methods for mutual aid and how they might be useful to participants. We will conclude by brainstorming other methods for inclusion in a future handbook.